Arguably London's oldest church (there's a bit of competition between it and St Paul's) St Bartholomew's is the most atmospheric church in London. 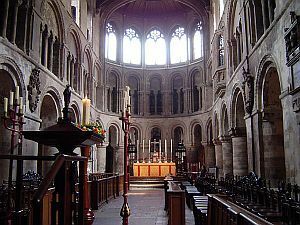 There is a gorgeous smell of incense upon entering the darkened interior, and the compact interior (compared to St Paul's) makes it a cosy place to contemplate in. Rahere, the monk who founded the church in the 1100s, and is buried in an ornately decorated tomb inside, is said to be both seen in his cowled robe, and heard within its walls. Great St Bart's is also a film star! It has featured in Four Weddings and a Funeral (the fourth wedding) and Shakespeare in Love, among others. Do check the church's website before you go, because it's not open to visitors during services. And beware there's a £4 charge to see around it - this goes to support the church's maintenance and is a bargain compared to St Paul's which charges £14.50 per adult. If you're thirsty afterwards, pop into the Hand and Shears pub in Cloth Fair, which runs alongside the church. An ale house has stood here since the 12th century - about the same amount of time St Bartholomew's has stood there. Why? Most atmospheric church in London.